Amy and Dave Freeman have traveled more than 30,000 miles by kayak, canoe and dogsled through some of the world’s wildest places, from the Amazon to the Arctic. They were named National Geographic Adventurers of the Year in 2014 and listed among most badass adventurers of 2016 by Outside magazine. Their adventures and their articles have been featured in a wide range of media from NBC’s TODAY Show, FOX and the Canadian Broadcasting Corporation to the Chicago Tribune, National Geographic, Outside, Backpacker, Canoe & Kayak and Minnesota Public Radio. Amy and Dave are integral members of the Save the Boundary Waters’ Coalition, dedicated to raising awareness about the threats of mining and industrial pollution to the Boundary Waters of the US-Canadian border. On September 23, 2015, Dave and Amy embarked on a yearlong adventure in the Boundary Waters Canoe Area Wilderness in support of the Campaign to Save the Boundary Waters’ efforts to protect the Boundary Waters from proposed sulfide-ore copper mining on the Wilderness edge. On September 23, 2016, they returned after 366 days. During the course of their Year in the Wilderness, Dave and Amy camped at approximately 120 different sites, explored 500 lakes, rivers and streams and traveled more than 2,000 miles by canoe, foot, ski, snowshoe and dog team. 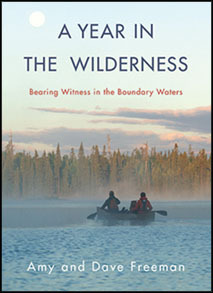 They have shared their yearlong adventure advocacy expedition in their recently published book, A Year in the Wilderness (Milkweed Editions, 2017), which was also documented in the short film, Bear Witness, and which was named as a Big Indie Book of Fall 2017 by Publisher’s Weekly. In 2014, Dave and Amy traveled by canoe and sailboat from Ely, MN to Washington, DC, on the Paddle to DC campaign as a first step in their efforts to protect the Wilderness. More recently, in the spring and summer of 2018, the couple biked over 2,000 miles and across 9 states from Minnesota to Washington, D.C., with canoe in tow, to continue to raise awareness and spread the word of the campaign. They documented their trip through regular social media updates, which are available through their Facebook page and blog. 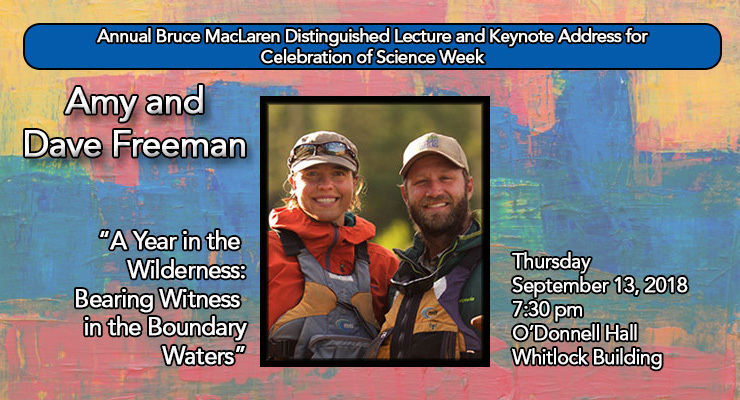 In addition to speaking at colleges, universities, libraries and other community organizations, the Freemans also run the Wilderness Classroom, an educational nonprofit geared towards inspiring kids to get outside and explore their world. Wilderness Classroom’s current reach is 100,000 elementary and middle school students, and 3,200 teachers around the world. Sponsored by the College of Science, the Department of Biology, the Division of Natural Areas and the Honors Program.